I read the first two parts of this series a couple of years ago, and have now got to volume 3 (of 6). 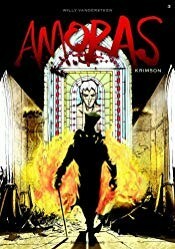 Suske and Wiske are trapped in the devastated future world of 2047, at opposite ends of the island of Amoras, subject to the machinations of the evil Krimson. Suske has hooked up with the attractive and dangerous Jérusalem; Wiske with other unsavoury types. Meanwhile in the present day there is a parallel plotline with a young woman called Marie, in a hospital with Aunt Sidonie. There seemed to be less fanservice and more world-building in this volume, which is a good thing. Charel Cambré's art remains outstanding. The plot sometimes jumps between storylines in mid-page, which is a little disconcerting. I would have enjoyed it more if I had come back to it a bit sooner after the first two, and will get to vol 4 a bit quicker. You can get vol 3 here. This was my top unread non-English language comic (the pilot's words in the frame above are an exception). Next on that pile, I'm glad to say, is the first of a new series by Leo, Retour sur Aldébaran.